First of all just look at that amazing cover. It only gets better from there. Second, I don’t think anything I can really say about this book will do it justice because it was just that beautifully written, but I’m going to try. But the bottom line is: read it, read it now. Elyria is lost, and that’s putting it mildly. She came from a broken family, a family that was then irrevocably shattered when her beloved, adopted sister Ruby takes her own life. Elyria has no one to talk to about this loss and nowhere to place her emotions. Everything is confining her and she has a force inside of her that’s itching to be let out. She leaves her husband, whom she doesn’t think she will ever understand or be understood by, and goes to New Zealand. Bringing nothing but a small backpack and the shoes on her feet, Elyria hitchhikes to the home of a writer she met once, who mentioned staying with him, and nothing more than that. She has no plans, and more importantly she doesn’t want plans. She doesn’t know how to live like a regular adult, doesn’t feel anything anymore, and wants to remain missing. The story is simple on the surface: nothing much appears to actually happen, but the introspection and fearless writing makes it so much more than a story about a wife who leaves her husband. There is so much going on in Elyria’s head and despite her descent into madness or depression, Catherine Lacey conveys those things so well. Every sentence is constructed in a way that will make you feel something. 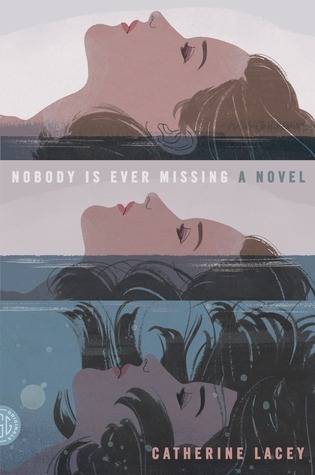 A blurb on the back of the book says “This book is a squall and Catherine Lacey is a force” and that just sums it up. The style reminded me a lot of Department of Speculation by Jenny Offill, which was one of my favorites last year. Strangely enough, I found Nobody is Ever Missing on a display titled “If You Loved Gone Girl…” But it’s NOT GONE GIRL, and not every book has to or should be. I finished this and immediately searched for anything else she’d written, and inhaled the short stories I could find. I cannot wait to see what she comes out with next, but I know that no matter what it is, I’ll read it. Wow – this review got my attention even though I haven’t read Dept. of Speculation. I’m a sucker for great writing though, and I like what you shared. And – let’s (my “let’s”, I mean the marketing people) just QUIT it with the “next Gone Girl” stuff…it’s killing the chances of these books to succeed in my opinion! It seriously is! And this is honestly so NOT Gone Girl that the comparison doesn’t even hold up, in my opinion. Wow, that cover IS amazing. That plus your review might make me overcome my strong aversion to stories where people’s sisters die. Oh wow, you are getting me VERY excited about this book. I heard Lacey in a book podcast with comedians and she was super interesting. I also read this article about “2014’s Literary Trend Toward Solitude as Feminist Statement” here http://flavorwire.com/495959/leaving-it-all-behind-2014s-literary-trend-toward-solitude-as-feminist-statement Very interesting! If you liked this, you might like All the Birds, Singing too (if you haven’t read it already). I loved it! All the Birds Singing was great! They all remind me of each other actually, that, Dept. Of Speculation and Nobody is Ever Missing, and I LOVE THEM ALL! Going to check out that interview now ! !